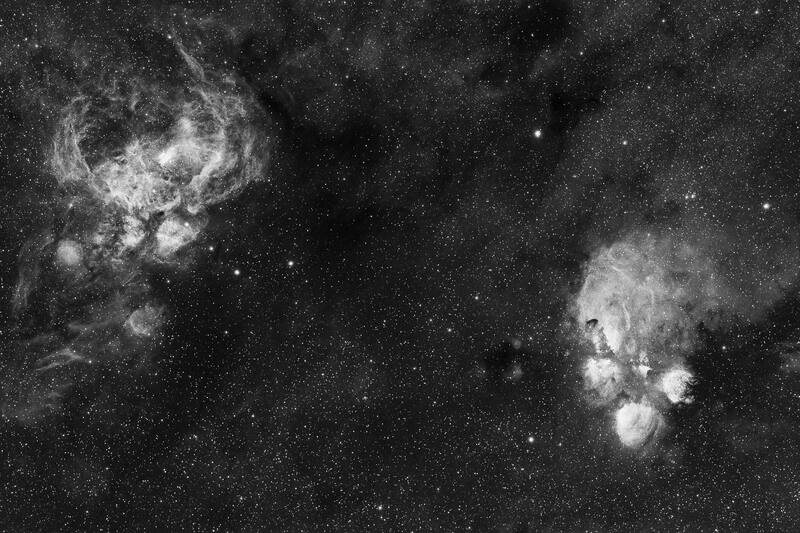 The Cat's Paw nebula, NGC 6334. Credit: European Southern Observatory (ESO). Giant blue-white stars in the heart of this southern nebula signify extreme electrical activity. The Cat's Paw nebula is also known as the Bear Claw nebula and carries the astronomical designation NGC 6334. It is 50 light-years across and approximately 5500 light-years away, as astronomers calculate distance. The glowing cloud is part of a larger nebular complex near the heart of the Milky Way and includes NGC 6357, or El Cangrejo (the Crab). According to a recent ESO press release, NGC 6334 contains an active star-forming region where hundreds of blue-white stars far more massive than our own Sun have been detected. The 2.2 meter Max Planck Gesellschaft telescope used several filters to create the image at the top of the page, particularly one that allows H-alpha (atomic hydrogen) light emissions to be seen. NGC 6334 would ordinarily be a brightly lit emission nebula if not for the intervening clouds of dust that cause "extinction" of blue and green light. Extinction is usually used to indicate the dimming of light in Earth's atmosphere from a direct beam transmission. The atmosphere either absorbs light, or certain frequencies are scattered. Atmospheric scattering is the primary mechanism that dims light on Earth, but in space the main culprit is absorption: dust and clouds of molecular gas "soak up" the higher spectral bands, which are blue and green. 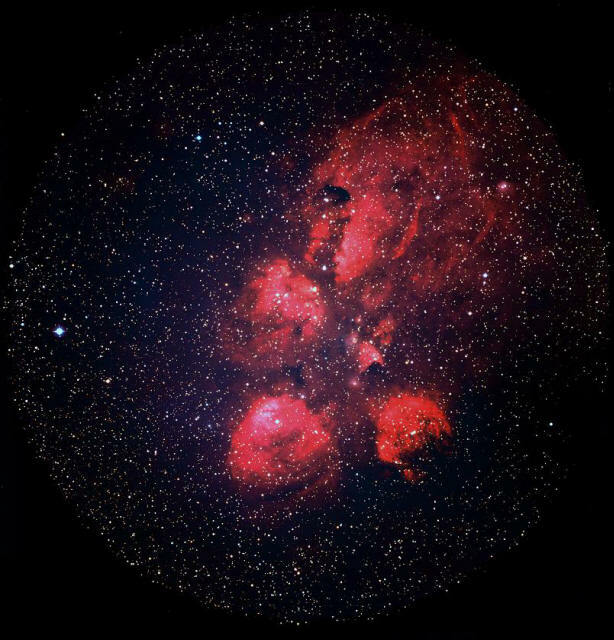 That is the reason NGC 6334 is given a red coloration when electro-optical devices display the image. As stated in the press release, the nebula is a prolific stellar nursery, with a potential population of new stars numbering in the thousands, although the dusty environment makes it difficult to see most of them. From an Electric Universe viewpoint, the bubble located in the lower right of the image is an interesting feature. ESO proposes that it is a dying star ejecting its outer layers, or perhaps the expanding remnant of a star that has already exploded. However, the converging radial filaments are likely indicators of an interstellar Birkeland current that is "pinching down" in an hourglass shape. Rather than a bubble, we might instead be "looking down the barrel" of a vortex, or z-pinch. An electromagnetic z-pinch can squeeze plasma with such force that it rapidly compresses. Electric current flowing into the z-pinch might cause the plasma to erupt in an arc-mode discharge. We are seeing plasma structures when we look at nebulae, and they behave according to the laws of electric discharges and circuits. Near the center of the Milky Way there is an abundance of electromagnetic energy, and it is in the most dense current flows where stars form. Stars are not born of gravitational forces, but from the electric nature of the Universe and the way that moving plasma behaves in a magnetic field. Previous Pictures of the Day have explained that an electric discharge in a plasma cloud (a nebula) can create a double layer, or sheath, along its axis. Electric currents flow along the sheath. Those currents spiral into filaments, or double layers, which attract each other. Instead of merging they twist around into a helix, gradually pinching down into powerful electric discharges. A star is born when those discharges reach the arc-mode state—the more intense the electric current the bluer, larger, and more energetic the star. NGC 6334 is in a highly energized state, so it is rapidly creating massive blue-white stars.